Want to find out if you’re a Top Shop in 2016? Our friends at CCAI (Chemical Coaters Association International) are offering you the chance to take a bench-marking survey to find out where your shop ranks in the Liquid Paint or Powder Coating industry for the year of 2016. The Top Shops Zone of PF Online also contains a link to the survey. The companies who complete the survey will receive 3 reports: an Executive Summary, Plant Type and Plant Size. These reports will provide you with valuable data on the powder coating/liquid painting job shop market with bench-marking intelligence for future improvement. 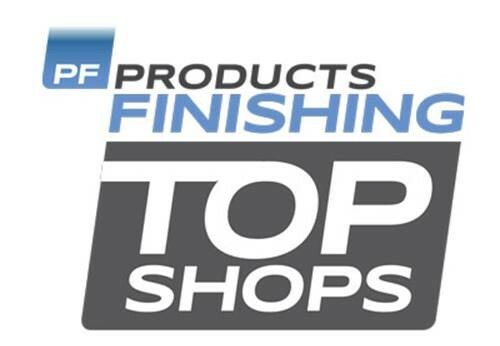 As an added bonus, Products Finishing magazine will also recognize the top 50 shops in the US in an upcoming issue of PF. Please note: the survey is ONLY FOR liquid and powder coating operations in the US. Chemical Coaters Association International is a valuable organization to be a part of. If you are not a member already, IntelliFinishing invites you to visit with them about becoming a member today! They provide the finishing industry with valuable educational opportunities and training. It also provides finishers with a forum to share their knowledge with other companies in the industry. This survey MUST BE COMPLETED by June 1, 2016. If you have questions, please contact Tim Pennington, Editor, Products Finishing, at Tim.Pennington@PFonline.com. You must complete a substantial portion of the survey to receive the bench-marking reports. We’ve Been Published in Products Finishing! 2016 Products Finishing Directory Magazine has published our article “Choosing A Finishing System Conveyor“. We invite you to read and share it with anyone who can benefit from the information provided within the article. For more information on traditional finishing systems vs. IntelliFinishing complete finishing systems, please visit http://www.intellifinishing.com/vs-traditional.html or contact us for a tour. We are always excited to share the features of this amazing automated paint system for manufacturers. The act of doing nothing or working slowly while waiting for a work cycle to be completed. Standing idle or marking time waiting for instruction, materials or information results in waiting waste. You pay for all of the time your employees spend waiting. This time is not adding value, therefore, your customers are not going to want to pay for it. Waiting time will come directly from your profit and every bit you can save will go right back into your profit. Frequently, waiting time is made up with overtime at a premium rate. While this is good for your employees, it is not so good for your profit. Waste begins long before production starts and is not just limited to production. Managers, buyers and operations personnel should also be part of the focus of waste elimination. IntelliFinishing takes a lot of pride in the Lean capabilities that our complete paint system for manufacturers is able to provide for our customers. No matter the size of your system, we offer you choices to eliminate waste in almost every area of production. Empty hooks and production gaps can be eliminated when you purchase our system that includes state-of-the-art technology. Your labor costs may also be reduced by minimizing the production gaps in your system. If your current system has line gaps or time intervals between hooks or carriers creating costly waiting waste, we invite you to contact us to discuss the options our systems can provide for your production pains. There are many ways an automated industrial finishing system with the latest technology can help to promote a healthy bottom line. Our expandable paint system for industrial manufacturers could be the paint system that you didn’t know you were looking for!